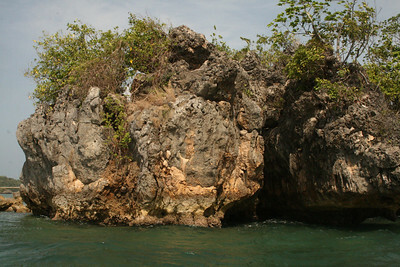 Because Guimaras is an island, it is only natural that island hopping tours are offered to its visitors by the locals. The usual starting point is Alubihod (or Alubijod) Beach where the resort we were staying in (Raymen Beach Resort) was situated. Raymen offers the usual tour of roughly 7 islands/places and the tour can be accomplished within 3-4 hours (longer if you take your time swimming in each island/site). You pay by the hour anyway, and regardless of whether you book from Raymen or not, the rates are standard all over the island. 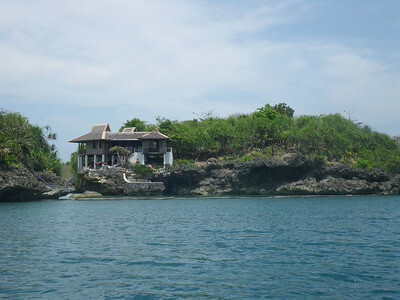 If memory serves me right, the places one can visit in an island hopping tour include Ave Maria Beach, Lawi Marine Turtle Rescue Center, Buho Ramirez Cave, Natago Beach (you can anchor and swim there if the owner of the island isn't there, since it is privately owned), Sol y Luna and Baras Beach Resort/Cave. 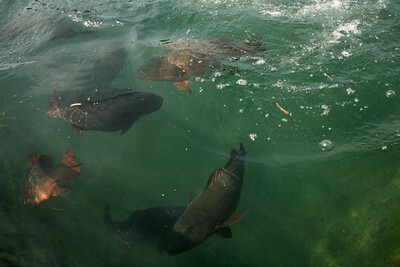 You can also venture out to the SEAFDEC Research Center if you're interested in big fishes and fish feeding. We opted to do the tour in the morning because the locals said the waves tend to be bigger in the afternoon. 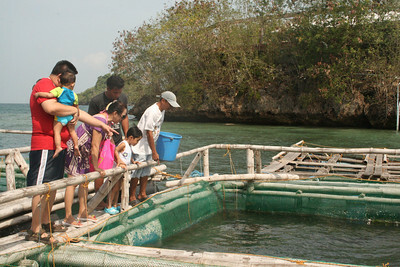 We started our Guimaras island hopping tour at 9:00 AM and proceeded first to SEAFDEC (Southeast Asian Fisheries Development Center) as it was the farthest and I promised my son fish-feeding. 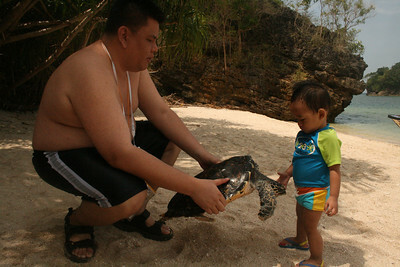 Our next stop was Lawi Marine Turtle Sanctuary, which actually only has one turtle for show (a baby still, at 3 years old). Apparently, turtles only lay their eggs there every 6 years, and the last time that happened was 3 years ago. When the turtles come laying, volunteers and biologists help make sure the eggs are not stolen (by people, to sell) or eaten (by other animals). The hatchlings are cared for and the weak ones are given time to grow some more before being completely released into the open sea. 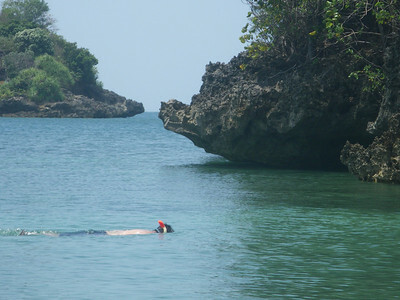 We chose not to make a stop at Ave Maria Island anymore, which is just across the turtle sanctuary and proceeded instead to Baras Cave. 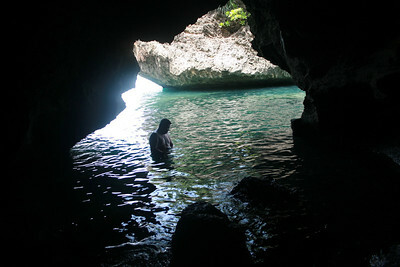 And when I say cave, I mean the boat goes into the cave to rest on the slippery rocks of Baras Cave. You'd hear bats inside and you'd have to swim out to really be able to do some swimming. 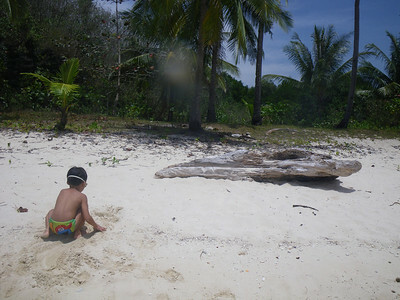 Because we had kids who wanted to swim and play in the sand, our boatmen (I really couldn't call them our tour guides because they never offered information, didn't really regale us with trivia or any Guimaras-pride stories) brought us to the other side of Baras Cave (different from Baras Beach where Baras Beach Resort is) so we can frolic in peace. After this, we decided to call it a day. We would have wanted to land on Natago Beach but we couldn't so we just viewed it from afar. 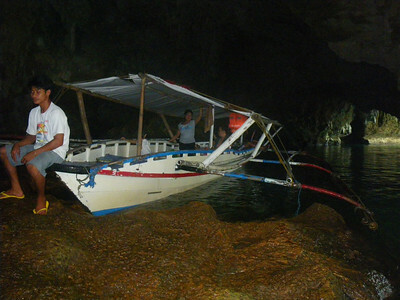 4-6 persons – 400 per hour plus 150 pesos per exceeding hour. 8 persons – 500 per hour plus 150 pesos per exceeding hour. 10 persons – 600 per hour plus 150 per exceeding hour.